For months there have been rumors about the state of rapper T.I. and his wife Tiny's marriage. Are they headed for divorce or not? In a sit down with Wendy Williams Tiny admitted there was a little friction between her and T.I., just like in any marriage, but they are NOT headed for divorce. "We had a couple fights and we were arguing." "We argue all the time, though. We had this one big fallout about the Grammys. It just lingered on and it got bigger and...We're still together, there's no divorce. We're normal. We go through the same thing that every marriage goes through." Tiny, however, was NOT wearing her wedding ring. and bodies need tune UPS sometime. WTF yall hearing? Que sera sera. Wendy ask her about her nose and she said she thought about getting it done, but it's a dad's nose. So proud of her that she decided to leave her nose the way it is. I hate this hair-do...looks like Olivia Newton John in Grease..
@8:48, bahahahahahaaa, I can't front that is EXACTLY what that looks like! I need caption and the red bouncey ball on my tv when she speaks! She looks like Lamb Chop...Shari Lewis's little hand puppet. Um she does not look like Olivia Newton John. How many times have celebs "fought off the rumors" only to turn around a few weeks later to announce the break up? Tiny said her finger was swollen and that's why she wasn't wearing the ring. Wendy gave her the side eye. Also she did admit her booty was fake. This is why we keep hearing those stories about chicken pills and girls pumping their booties up with fix-a-flat. Y'all better learn to love what you have. Okay he's had three children already with other women while they were dating. She s thinking we married now. Who cares if he has one now? Watch and see don't the baby join the cast. He loves taking care of his children. I don't believe there is an outside baby, I think they put that story out there themselves to garner attention to March 31st. ...and then if they argue ALL THE TIME, I guarantee that one of those last two children will be affected in the future over that crap. 11:01, i luv her hair too. 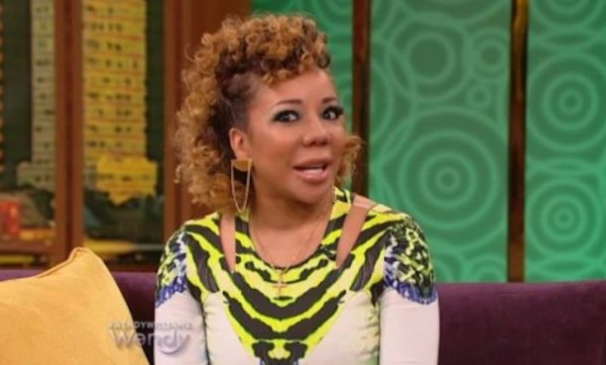 This hairdo on Tiny is a breath of fresh air for me. Lmao @MsLee. That hair is ugly as hell. Magick said, "Now that I see it, I can't UNsee it..."
I'm right there wit you bro. OMG I looooooooooved "Mama's Family" growing up! I remember TBS playing the reruns and I would watch it when my grandma picked me up after school.